Ya gotta wonder about that guy over at Google who's making the daily Google Logo. Today's Samuel Morse's birthday? Brilliant. I find many of them to be quite lovely, sometimes even amusing, and yet all that work for just a moment of "hmm clever's" around the globe. Though I suppose, many of us don't even get that daily moment... especially at work. But I guess they have a larger pool of eyes and the added bonus of it not being important enough to hear the complaints if when its boring either. 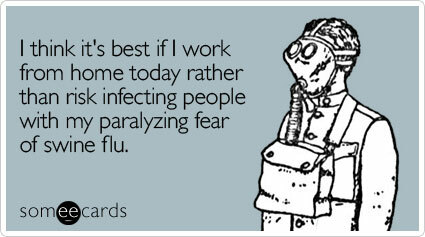 There are so many Swine Flu someecards I don't know what to DO with myself!! Knowing my penchant for illnesses and my impossibly weak immune system... I better steer clear of Mexico. Speaking of which, I would really like to go to the Jungle... anyone want come with me? In tribute to Bea... CLASSIC. It took me until now to have a bouncy house party and in attendance were two people from when I was 5… funny how life works out huh? For this diatribe I’ll provide some images on the off chance that like my brother, you are protesting the facebook: http://www.facebook.com/album.php?aid=119397&id=703236350&l=fe2051c069 Mo had the brilliant idea of having relay races through the obstacle courses in which every adult would grab a kid, form two teams, and run through the course together, starting when you saw someone before you at the top of the slide. I had the forethought of stealing Morgan as my partner early. The first time around I was still trying to get the lay of the land…. Army rolling it instead of leaping over tunnels, crawling instead of running, pushing stead of dodging obstacles, but hey… that was a okay b/c Morgan explained where adults could take advantage before she miraculously sped away not to be seen until we were sitting down. When finally my sister made me trade partners, I think a couple people were angry that I had been hording the speedy Gonzalez… but I was perfectly fine pairing with Kyle b/c you could literally toss him over and across and up to take the lead. When I switched again and Briana got Kyle she had to clarify “now, I can just toss him? Really?” Yes, Really. (are you taking notes? You’ll need this info if you’re ever going to compete professionally or even just to be on my team at the next party.) After the first race I think one and all were surprised at the rigorous work out a silly relay could be, and I should have rested in between instead of running around the other houses, but who wants to miss out on any fun?? My trainer used to always tell me that the key to exercising was finding an activity that you enjoyed. The fact that on my initial paperwork I had written that I hate exercise presented to him a personal challenge… and it wasn’t until he started having me jump and skip through some “ladder” thing did I finally admit that I could enjoy exercise. If I could be happy doing that on a gym floor… image my bliss when presented with a bouncy house! Someone has to create an adult gym entirely made out of blow up obstacle courses… sitting on gold mine Trebek! b/c it's been a while since I complained about how cold it is, I am feeling a need to complain about how hella hot it gets around here. I know... I'm never satisfied. Although, on a side note, as I was switching windows with screens around the house with my dad yesterday--a task that his skills far exceed mine btw--It struck me that he has been changing these same windows for the last what? 37 years? I wonder what that's like. (Not the act of changing windows for that long though.. ugh)...but of having something for that long that you know all the ins and outs, the idiosyncrasies, that you don't just possess something, you "own it." I'll probably never know b/c frankly, that requires some commitment capabilities I don't just not "own" but I don't even think I've possessed them yet. I'm not sure if I'm allowed to complain about licensee's that I'm working with so let's just say I had some issues with company "B" on Friday. It was the first time (and I know, those who have worked with me will be SHOCKED to hear this" that I realized not only to I act like a total female sometimes at work... when I was disappointed Friday morning I actually sent an email to company "B" entitled "Sad Face" and had to stop short of sending Will Farrell's SNL "I wish you weren't such a liar" skit. And like in any relationship when one party knows they've been naughty, I got a "We still love you." to which I sarcastically laughed and said "uh huh." I'm not proud of my reactions, but I think recognizing and admitting my faults are the best way to fix them... don't you?